I started training with Steph about a year ago, I was nervous and a new to fitness. Steph made me feel at ease and guided me to where I am today! Steph pushed and inspired me to want to get fitter and keep improving! . I didn't realize i had any fitness ability until Steph guided me and convinced me to try new exercises . I explained what I wanted to achieve and Steph introduced me to her classes and pushed me through various gym based programmes, always stepping it up when she felt i was ready! On starting the gym I couldn't do a 3/4 press up and now I can do full press ups with strength and ease. I started Stephs kettlebell classes believing i would never move on from a 4kg weight,now I'm onto the 12/16kg,depending on the move. I normally give up on hobbies in life but not fitness, I have become addicted and it's now an important part of my life. Steph has been a huge help along the way! If you need help and a healthy push with your fitness goals and want results, stephs the one for you! Thank u Steph. I have been working with Steph on my fitness level and most importantly “the bingo wings” since July 2013. I always thought I was quite fit, attending various exercise classes however these were very infrequent. We all find excuses why not to go to the gym or exercise as we all have a busy life, my family and work take up a lot of time always running my daughter to different classes and clubs, housework and shopping etc. Using Steph is a great option for me, ﻿firstly I don’t need childcare for my daughter as we do the session at home﻿, and secondly if I have a session booked I know that I have no excuses. What I like about using Steph is that during our sessions she is firm with me, however not a Sergeant Major, and I feel very comfortable with the way she teachers. 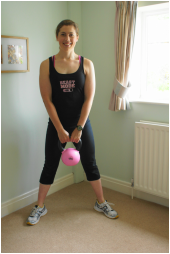 ﻿Steph has a very positive/persuasive attitude about how far you can push yourself﻿, when I first started I found it hard using arm weights or doing press-ups now I am using 16kg’s kettle bell and can complete 12 full press-ups. Since using Steph I have toned up, including my bingo wings, in total 50 centimetres and reduced my body fat by 5 %. I train twice per week and now compliment my training with running twice per week, which previously I could not do. I can’t believe I have been training for over 12mths, ﻿every session is challenging but fun and keeps me motivated, I feel fantastic at the end of the hour.﻿ I will continue to use Steph and would definitely recommend using Steph to achieve your targets of either weight loss, fitness level or simply feeling great. ﻿Thanks Steph for making exercise a fun and positive experience. "I have trained with Steph for well over a year now and I have achieved a weight loss goal I was really struggling to achieve previously. Steph has been so helpful with food and nutrition advice aswell as exercise and regular weigh ins and taking measurements. Steph never judges or gives negative feedback, you always feel positive and that any goal is achievable." See my progress below. Really miss going, had a short stay near Richmond for couple of months and enjoyed the class (Armageddon) immensely.Highly recommend for anyone who likes a challenge. 'I’ve always wanted to know how to eat healthier and after seeing an advert from Steph on Facebook I made the call and signed up to her 6 week programme. I never actually thought about weight loss as I was just more interested in healthy eating however by following her advice and adding exercise to my lifestyle I have actually lost 1lb short of 1stone and 14.5 inches all over. I can honestly say that by having to produce food and exercise diaries I really committed to it and thanks to Steph I do feel that I have made a lifestyle change that I am thoroughly enjoying and will continue”. See my results below. Steph eased me in gently giving me an exercise regime to follow and then provided me with a fat busting diet plan too, which i have done for the last four weeks. Steph was there every step of the way with encouragement, advise and support, progressing the exercise plan as my fitness level improved. I haven't reached my goal yet but I know that I'm a lot closer now than I was just 6 weeks ago, and i'm sure with Steph's continued support i'll get there soon! Just look at the visible results for yourself! 'We made it! Four days, four marathons in gale force 8 winds and Blizzards over 100 miles of Norwegian wilderness covered and 3km upwards in total.Yesterday was the last marathon 40 km trek in snow finished in just over 7 hours. Huge thanks to my husband for staying with me all the way and for the team that got me here-what an incredible journey its been!